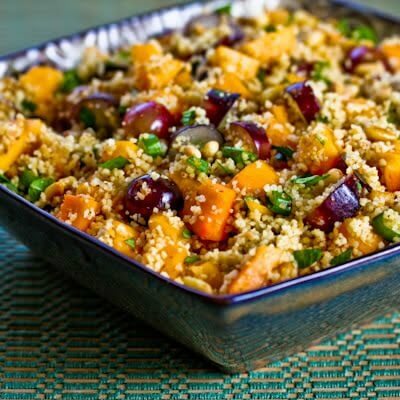 You may never encounter a side dish as simple as a warm pumpkin and couscous salad. A popular staple to many North African Arab dishes, couscous originated in North Africa and spread to France and South America around the 16th century. It is a great source of antioxidants and can help prevent pre-mature ageing. The presence of selenium in couscous helps the body produce antioxidants necessary to keep us healthy. Additionally, the regular inclusion of couscous in a balanced diet can help regulate blood pressure and heart rate due to the presence of potassium. Chop the pumpkin into small consistent size cubes about 2cm wide and place in a bowl. Drizzle the olive oil, cinnamon, cumin and salt (to taste) over the pumpkin cubes and mix well. Place the pumpkin cubes onto the greaseproof paper and place in oven for 30 minutes or till pumpkin is tender. Pour vegetable stock into a saucepan and bring to the boil. Once stock boils remove saucepan off heat and stir couscous through with a fork. Cover with lid until the couscous has fully absorbed the vegetable stock. Stir couscous through with fork again and add sultanas, fresh coriander, lemon juice and pumpkin. And, finally, serve it to your highly impressed guests.